Make transit trips in the Minneapolis/St. 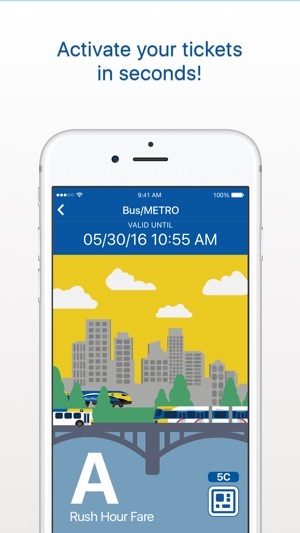 Paul metro area as mobile as you are with the official Metro Transit app. Now you can plan your trip, see departure information for bus and trains, and buy transit tickets all on the go! Just download the free app, create an account with your method of payment, and get moving. 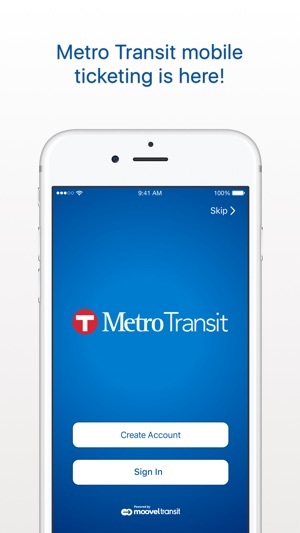 The Metro Transit app is a tool to make riding the bus, METRO system and Northstar in Twin Cities a little bit easier. 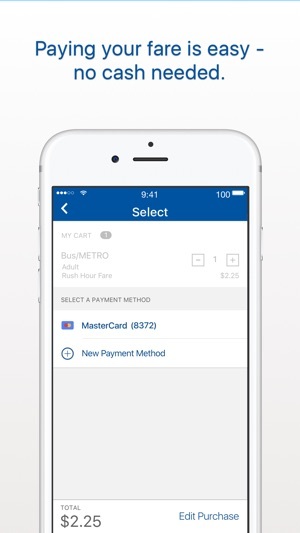 After you’ve identified your desired trip and transit departure time, you can buy and use Metro mobile tickets right from your smartphone -- it’s like having a Metro vending machine right in your pocket! Simply create an account and enter your credit/debit card information in our secure system. If looking to pay with cash, you can use a pre-paid debit card or use the PayPal Cash Card. Do I need to be connected? An internet connection is required create an account, sign-in and purchase tickets, but you can use/activate your tickets offline. Just like with paper tickets, you're responsible for making sure you have a valid fare at all times, so be sure to plan ahead! 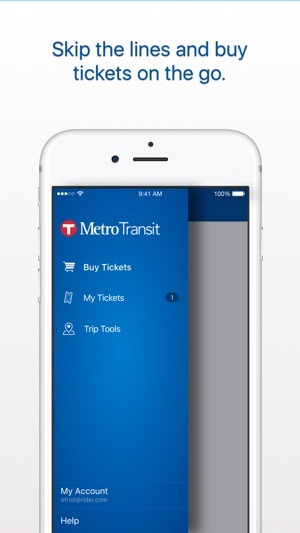 • Don't uninstall the Metro Transit app or erase your phone without transferring your unused tickets first. Your tickets are stored on your phone (which makes it possible to use them without an internet connection), so uninstalling the app can permanently erase your tickets! • Watch your battery level... Just like with paper tickets, you're responsible for making sure you have a valid fare at all times. Performance improvements and security updates. This app isn’t 100% complete. At least I hope not. Being on jury duty this week, I’ve found myself riding the bus to the courthouse. There are a few things I’ve come across that leave me wondering who pressed ‘submit’ and put this thing on the App Store. - You need to be able to save favorite locations! This is fundamental for a user who will almost always go home using Metro Transit. Going further, I don’t think it’s too much to ask to integrate locations from the users contact list. - Just list what the fare is on the trip planner section. You can’t even go back and look to check or you’ll reset everything. - Add a back button! - Integrate bus arrival time into trip planner instead of making users leave your app and go to their message app to check. Not that hard to check but it’d be so much easier just to see which route will be getting to a stop first! The arrival data from the boards at stops and the text feature has to come from somewhere. Why not just put it in app? I’d rather use an app over digging through bookmarks to get to the website. I really want to like and use this app. I hope my suggestions are considered for release in the future. This app is clunky and looks like parts of the web page were just exported for a quick project to say they “have an app!” Can’t click BACK from any screen which means if I want to change any part of my search I have to start from scratch. Having to go to a collapsible menu for everything is really annoying! And the map is not interactive, meaning if it shows me which buses serve a stop I can’t select one to see that schedule. Also the “find me” doesn’t always work even when I have all the permissions and settings correct on my phone. Also, I can’t save my routes or stops for easy access later so I again I have to start from scratch every single time. Super annoying!! 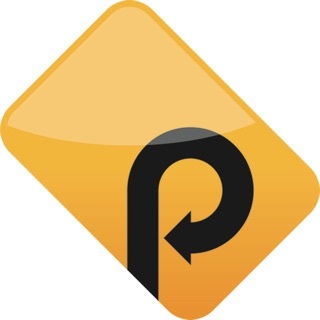 This app allows you to pay for passes on the go, which is nice. And you can store payment info, so you don’t have to purchase in advance if you don’t want. 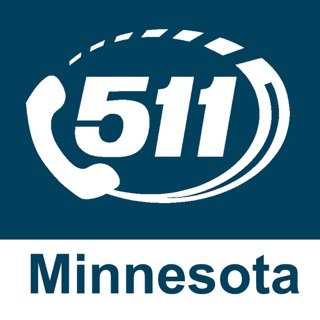 I live in central Minnesota and only use metro transit occasionally. Usually when traveling into town for a conference or meeting. Nonetheless, I have certain spots I travel to/from regularly. But you can’t save these spots in the app. That’s ridiculous. Also, once you enter your trip info, you can’t alternate between map view and trip details. So if you look at the map, you’ll lose details on which bus you’re taking next. Absurd. This sort of UI isn’t that difficult to create. I don’t care, charge a minimal fee to use the app. But at least make it work!